One of the most influential books about children ever published, NurtureShock offers a revolutionary new perspective on children that upends a library's worth of conventional wisdom. With impeccable storytelling and razor-sharp analysis, the authors demonstrate that many of modern society's strategies for nurturing children are in fact backfiring--because key twists in the science have been overlooked. 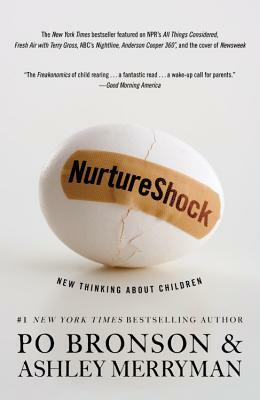 Nothing like a parenting manual, NurtureShock gets to the core of how we grow, learn and live. Released in hardcover in September 2009, NurtureShock remained on the New York Times best seller list for three months, and was one of Amazon's best selling books for 2009. The book has become a worldwide phenomenon with editions published around the world - in fifteen languages, to date. Why the most brutal person in a child's life is often a sibling, and how a single aspect of their preschool-aged play can determine their relationship as adults. Why are kids - even those from the best of homes - still aggressive and cruel? The answer is found in a rethinking of parental conflict, discipline, television's unexpected influence, and social dominance. Parents are desperate to jump-start infants' language skills. Recently, scientists have discovered a series of natural techniques that are astonishing in their efficacy - it's not baby videos, sign language, or even the richness of language exposure. It's nothing you've heard before. Po Bronson and Ashley Merryman's New York Magazine articles on the science of children won the magazine journalism award from the American Association for the Advancement of Science, as well as the Clarion Award from the Association for Women in Communications. Their articles for Time Magazine won the award for outstanding journalism from the Council on Contemporary Families. Bronson has authored five books, including the #1 New York Times bestseller What Should I Do With My Life? "The Freakonomics of child rearing... a fantastic read... a wake-up call for parents." Astonishing... prepare to be slack-jawed... This tour de force is one of the best parenting psychology books in years and will likely be seismic in influence." Compelling... Captivating... Explains cutting-edge research to the lay readership... It's riveting." "A highly readable Malcolm Gladwell-esque look at the social science of child rearing." "The most important book I've read this year... If you only read one thing I review, please make it this." "Some of the most groundbreaking research on children conducted in years... will knock your socks off." "Engaging.... revelatory... A funny, clever, sensible book. Every parent should read it." "Adds insight to irresistible nonfiction subject matter... destined to turn up in conversations among working parents." "The least touchy-feely [parenting book] ever... hard to put down and easy to take seriously." "Irresistible... [NurtureShock] will make you a better mom or dad without you even knowing it."